"Here's A Simple, Proven 30-Day, Step-by-Step Blueprint For Generating $500+ Per Month As An Affiliate Marketer"
​Everything You Need to Start Profiting As An Affiliate FAST! As you may already know, the affiliate model is one of the quickest and easiest ways to start making money online... You promote your "affiliate link" and get paid when people click thru your link and buy the product you are promoting. SIMPLE. ​Making money online with affiliate marketing is nothing new... The problem is, up until now, most people are ​working way too hard at it (and failing). How long have you been trying to make money as an affiliate marketer? How much money have you spent trying to find the "secret"? Which of the following can you relate to? ​The systems you've tried so far weren't clear enough, so you got stuck, frustrated, demotivated... eventually gave up and tried something else. You've seen other ​boasting of making thousands online with affiliate marketing... you're wondering why hasn't it worked for you? You want an easy to follow plan... laid out step-by-step... that's doable (even on a part-time basis)... That's foolproof... that actually works! The key to winning the affiliate marketing game is to discover how to build a list of hungry buyers, then sell products and find solutions that they're willing and eager to buy. 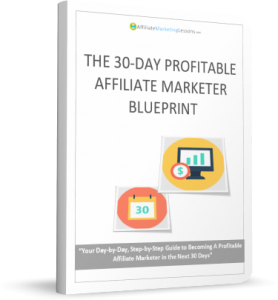 In the 30-Day Affiliate Marketing Blueprint, everything is broken down into daily action steps for 30 days. Most daily assignments are very quick to complete (you could easily do 4-5 in one day if you wanted). How to choose a hungry niche and the secrets to choosing a profitable product. How to choose a great domain name, web host, and auto responder. ​How to create a mini-course and high-response landing pages. How to get back links, distribute content to article directories, and more surefire methods for getting traffic. How to drive a targeted traffic using social media marketing. How to get targeted clicks and traffic on niche forums and the secret of getting targeted traffic... almost instantly. How to increase sales by adding value to an offer. How to build relationships with your subscribers. Template sets in weight loss, dog training, and internet marketing to create all the content you need. ​This 74-page ​blueprint is concise, but comprehensive. No fluff. No filler. Just meaty steps to follow, taking you from "start to finish". ​Although I'm sure you're chomping at the bit to get started, you might be thinking in the back of your mind, " what if this isn't for me? " Listen, there's no need to say " Yes " at this point. Just say " maybe ". Order the 30 Day Profitable Affiliate Marketer Blueprint ​below. Go through the 30-daily steps and try it for yourself. If it doesn't work for you, then email me back and I'll credit your money back - no questions asked. ​If you aren't completely satisfied, just email me and I'll refund your money. It's that simple. You get to work through the 3​0-daily assignments at ZERO RISK to yourself. Go ahead, try them out. Test this ​​Blueprint thoroughly. I'm confident of the results. At any rate, you have nothing to lose. And money to gain. ​YES, this is exactly what I've been waiting for! I'm eager to learn how to make money as an affiliate marketer! ​Click Here To Get Your Personal Copy Now! P.S. Remember, you get to try out the entire ​​Blueprint - literally work through the 30 daily assignments - BEFORE you decide if you want to keep it!